So the lamp is working fine. Here it is suspended to the stairs for duration testing. So dimming works, remote control works and temperature measurement all works. For some reason Lux measurement is not working, I think I may have fried that sensor by accident. Cabling is still somewhat of a mess, but I was thinking of sorting that out when the lamp is moved to it's final place. Right now there are two locations where active circuitry is located: near the lamp for temperature measurement and fan control, and near the power supply for on/off (relay), wireless, dimming and lux measurement. These two locations are connected via a whole bunch of cables. And I'm already doing cheap wireless at one point. That is just silly! So the next step will be creating a separate board with wireless for each of those two locations. The only wiring remaining between the two locations will be a 12V/GND cable, and of course the LED current cable. To be continued, but somewhat further in the future as I'm working on some other things at the moment, and I want to design some proper PCBs for the next step that fit in a nice casing and such. 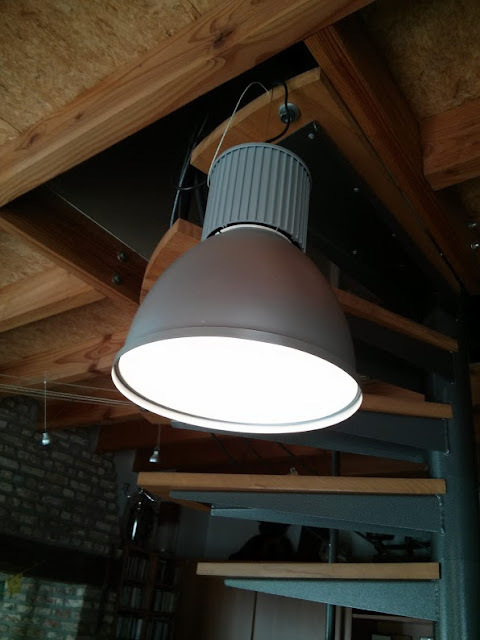 read on at http://joost.damad.be/2013/07/high-power-led-retrofit-part-5.html !